Yes, out of all the possible titles I opted for the most obvious pun. Guilty as charged – etcetera, etcetera. 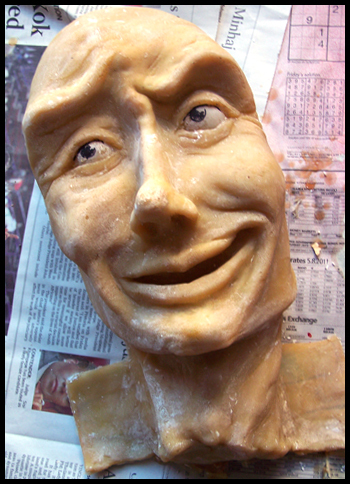 In my slim defense I have been somewhat sort of almost high on the rich aromas of liquid latex and cough syrup; the earthy smell of clay is just layer of the crafty bouquet of my flat right now. What have I been caught up in that my flat should be put through such punishment? iQonga. Which probably just deepens the mystery, since very few people seem to actually know what iQonga is. In brief it means ‘platform’ in Xhosa, and that’s the goal of the project curated by Handspring’s Jason Potgieter, to give artists working with puppets and in visual theatre a platform to show off their style. Six or so companies and individuals each get to produce a 10 minute piece, once off, with some money and support from Handspring. I’m lucky because I get to work on two. And I didn’t even get my proposal accepted. Kim Kerfoot (that mysterious cipher of a theatre-maker who produces work all too rarely) and Sanjin Muftic (my Bosnian buddy and long time conspirator) both wanted a slice of the Keevy. So now I’m designing and building for Kim and fully collaborating with Sanjin. Kim’s piece is called Guillotine and is about [SPOILERS!] a Guillotine. The biggest challenge of this project is the severed heads. Which are also puppets. After a good chat with Janni Younge about the process I dove into a bucket of rapidly hardening plaster of paris. I would be working with materials that were new to me and with clay, which I haven’t seriously played with in years. I’ll put the whole process into a tutorial (including where to buy the good stuff cheap) and post it after iQonga, I promise. The clay was like coming home to Sunday lunch. I didn’t even know how much I’d missed it. I first made about 10 ‘sketches’ in plasticine and then Kim picked the characters he wanted. 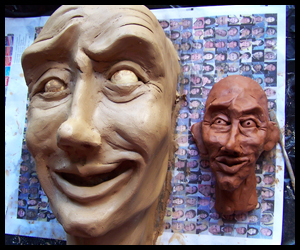 I sculpted them full size in clay and cast plaster molds. I messed up a couple of times and ruined one bucket before I nailed the process. I like working alone and at my own pace. I’m a slow learner, but a tenacious one. So then the latex went in. It smells disgusting. Like ammonia. Like week-old urine. 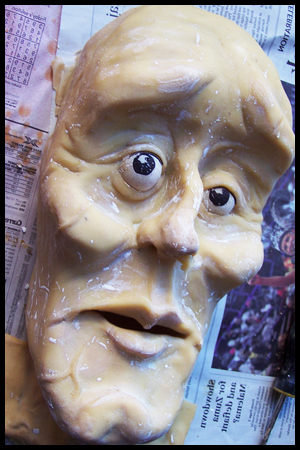 But when I peeled the dry faces out of the molds I was stunned. I knew it was meant to be an amazing material – I just sort of assumed I’d have to have a few duds before I got the hang of it. It is such an easy material to use, as long as the clay and the plaster have been done right. They need to painted and dressed, but I’m feeling pretty pleased right now. This entry was posted in Projects and tagged Guillotine, Handspring, iQonga, Jason Potgieter, Kim Kerfoot, Latex, Out the Box festival, Puppets, Sanjin Muftic, Theatre, UNIMA, Yawazzi. Bookmark the permalink.